Glucosamine is an amino sugar produced by the body for use in tendons, ligaments, cartilage, and the fluid around the body’s joints. Although glucosamine supplementation has been used successfully in Europe for two decades, it is only recently gaining popularity in North America. Glucosamine can be helpful as a supplement to dogs to support healthy joints because it provides building blocks for synovial fluid, cartilage, and connective tissues. Glucosamine dosage is dependent on the size of the dog and whether it is being used in combination with other supplements. For instance, glucosamine is perhaps most effective when combined with another natural joint supplement called chondroitin sulfate. 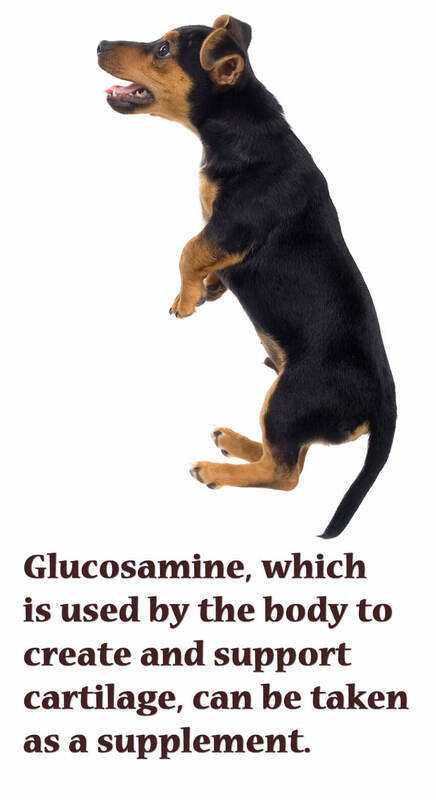 In these cases, as little as 250-400 mg of glucosamine (per 40 lb. dog) is known to be effective. This dosage can be doubled or tripled for dogs to speed up time of action and effectiveness, with any unneeded glucosamine being safely excreted. Glucosamine is commonly harvested from the chitin (shell) of shellfish. Allergies to shellfish are usually related to the flesh of the shellfish, not the shell, so even dogs with shellfish allergies typically do well on glucosamine. Glucosamine side effects are relatively rare and minor (e.g., diarrhea, gas, constipation), and giving glucosamine with food can alleviate these effects. There are positive side effects as well. Healthy joints enable dogs to live more active, healthier lifestyles.